Randolph EMC’s solution is built for Apple iOS devices and leverages ArcGIS for Server and its iOS SDK. The app keeps track of inspection reports being created in the field throughout the network. 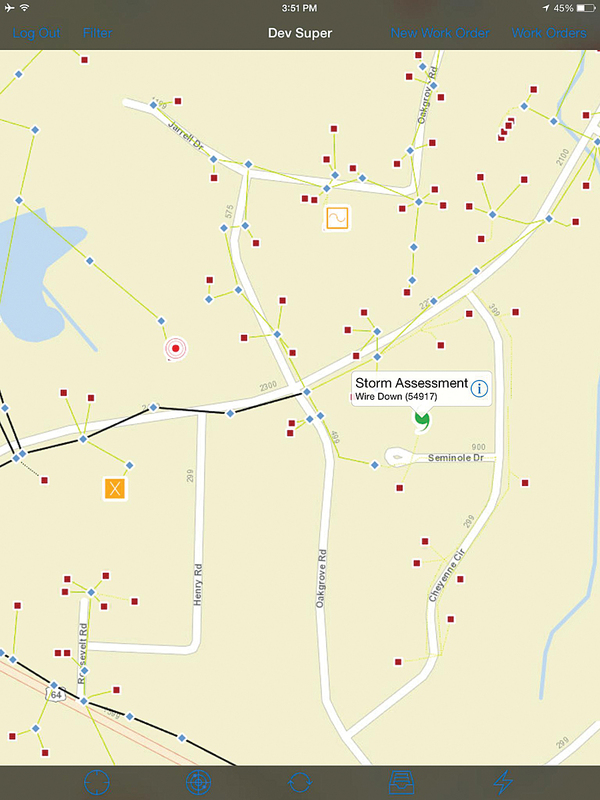 A web map dashboard app displays all work orders on a map with symbols and colors showing job types and status. Randolph Electric Membership Corporation (EMC) currently serves more than 31,000 consumer-members in the North Carolina counties of Randolph, Moore, Montgomery, Chatham, and Alamance. This service area covers more than 4,100 miles of lines through rolling hills, river valleys, and forestland located approximately at the geographic center of the state. Operation dashboard web application used for tracking the status of field applications in office. Randolph EMC performs routine inspections and storm assessments of its field assets. These inspections ensure safety and reliability of the network, thereby increasing customer satisfaction. Traditionally, these inspections were done using a paper-based system. Randolph’s inspectors reported various issues by using paper documents, which were reviewed by supervisors and given to technicians who were responsible for fixing those issues. Randolph found it difficult to track the status of all the work orders that were initiated by the field inspections. It also wanted to reduce the time required to resolve any complaints from customers. So, it decided to seek a replacement for the legacy system that depended on paper documents, spreadsheets, e-mails, and telephone and radio calls with a modern solution that uses mobile devices. Randolph EMC evaluated a few solutions and decided to implement geoOrganizer, developed by Esri Silver Tier Partner GISbiz of Nashville, Tennessee. This solution is built for Apple iOS devices and leverages ArcGIS technology. The implementation consisted of an iOS application that works on iPad/iPhone natively and a web GIS dashboard application. This solution enables Randolph EMC to keep track of inspection reports being created in the field and also which employee was creating, working on, or completing a field inspection throughout the Randolph EMC asset network. The solution leverages the latest capabilities of Esri’s ArcGIS for Server and its iOS software developer kit (SDK), thereby supporting enterprise data integrations without compromising the usability of the solution. Randolph's asset information as shown on a mobile device. Field inspections change from orange to red to green as they are unassigned, assigned, and completed. GISbiz’s geoOrganizer streamlines the communication between different groups of personnel involved in utility field operations. Randolph EMC organized its field staff into three groups, namely, field inspectors, supervisors, and technicians. The workflow starts with a field inspector who finds an asset that is in need of repair or maintenance. This could be anything from a broken pole to sagging power lines. Then the inspector takes notes and photos of the problem and assigns it a criticality level. Because this is a native iOS application, one immediate solution is that all the documentation can be done with or without Internet connectivity (called “disconnected mode”). Once within range of a Wi-Fi or data network, the inspector simply taps a button to send the inspection report to the supervisor. The supervisor can review the photos and notes and assign a technician in the area to address the problem. The technician gets notified of this assignment in real time. The application provides turn-by-turn driving directions to any of the inspection report locations that are documented. In addition, a web map dashboard application shows all these work orders on a map with easily identifiable symbols and colors indicating their job types and status. Once the technician completes the job, the supervisor gets notified immediately. The inspector and supervisor have the option to complete the work orders as well. Using these tools, Randolph EMC was able to streamline the field inspection process, monitor operations effectively, and provide value to consumer-members. Robert Ealy is a GIS analyst and geospatial consultant at GISbiz in Nashville, Tennessee. Brandon Fyffe and Makensie Coslett are business development managers at GISbiz. For more information, contact Dennis Mabe, vice president of Engineering and Operations, Randolph EMC, and Brandon Fyffe, business development, GISbiz.